A kids birthday cake is on the top of the list when preparing a kids birthday party. 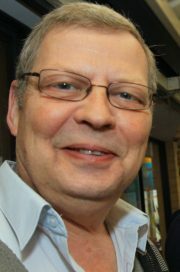 You can order a Cake man from any Danish bakery in Denmark and if living abroad and there is a Danish bakery in your area they should be able to help you. Make your own Cake Man. 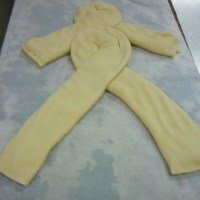 To feed about 20-24 kids you will need half a mix of the recipe of Danish Pastry and a big oven, about 90 cm vide, if you only have a 60 cm vide oven or you only need to feed 10 kids use about ¼ of this recipe or make two cake men. 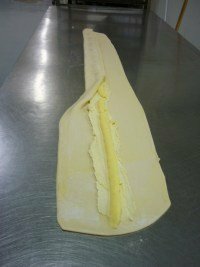 Mix and fold the Danish pastry as per recipe and you will end up with a piece of dough at about 750 gr. Roll out to a length at about 130 cm. And about 10 cm. wide as photo #1 and add Danish filling and custard and fold the pastry over, brush it with water and fold the other side as well, see photo #2. 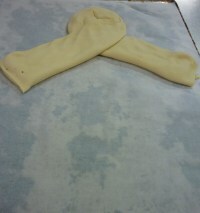 Divide the pastry into 2 pieces, one about 55 cm and the other about 75 cm and turn it upside-down and make the 55 cm into a bow, see photo#3. 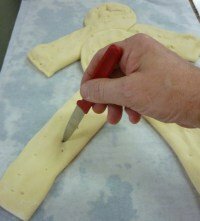 Do the same with the 75 cm piece of pastry and place on the baking tray as shown on photo #4 and make a few holes in the pastry with a knife,see photo #5. Let sit for 30-45 min to rise and bake of at about 180°C. to golden in color. 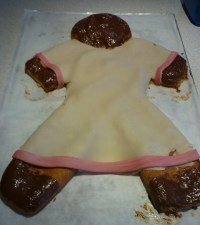 Brush the head and the end of the arms and legs with melted chocolate. 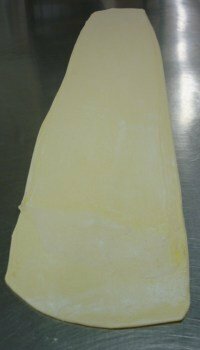 Roll out about 500 gr of cake marzipan to cover the pastry, see photo #6. 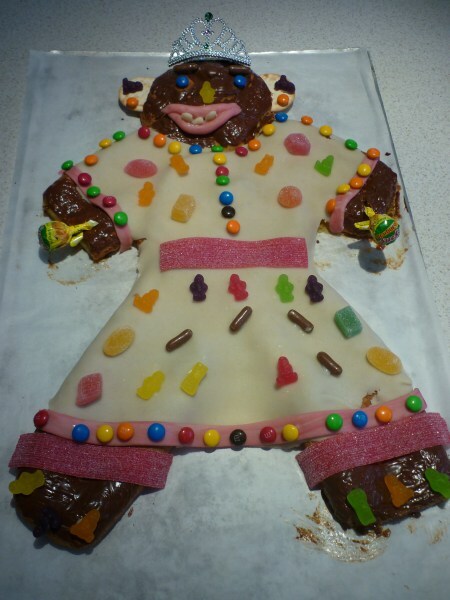 Decorate it with your choice of lollies, see photo #7. Leave Kids Birthday Cake And Go To Home Page.